If you’re new to family camping then it can get a little daunting looking at all the sleeping options when you visit your camping store. Lots of sleeping bags, mats, beds, etc. Which one is best? What should I buy? We’ll we’ve put together this tutorial-style video to help get you up to speed, so that you know what you need to do for a good night’s sleep. So if you’ve watched the video, you should now have a much better idea on what sort of things you need to get and need to do to setup your tent properly for sleeping. Just as important as the sleeping bag is what you are actually going to lay on. You need something that’s both comfortable and also easy to get to the campsite. 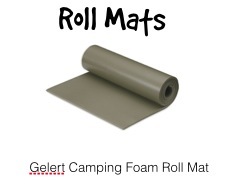 Back when Shell and I were kids, a Foam Roll Mat was something you slept on if you went on a school (or guides/scouts) camping trip. Even though ‘camping’ may be just sleeping on the floor in a village hall. They’re cheap. They’re simple. Just unroll and put your sleeping bag on top. …..but they’re not the most comfortable thing to lay on. These days there are some much better options (though was surprised when one of our kid’s Girl Guides put it on the kit list for a camp!). Most people use Air Beds when family camping. These are inflatable mattresses that you pump up at the campsite. You can inflate them with a hand pump, foot pump, or even a 12v electric pump that you can plug into the car. Although these air beds are smaller than your bed at home, they provide a reasonable mattress that folds down small for transporting. They’re not perfect though: you need to take extra care when the ground is cold (more on that in a bit), and if you’re in a double airbed, you may bounce when the other person moves (think ‘bouncy castle’, but not quite as bad). We’ve had Air Bed’s for years, and have been using the Campingaz QuickBed, which are relatively cheap, but have survived 100s of nights under canvas. 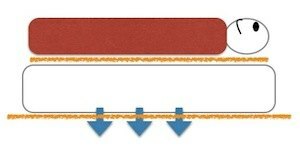 SIMs (Self Inflating Mats) were initially invented for the back packing community. 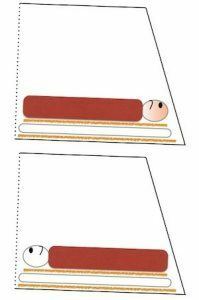 A SIM will fold down smaller than a foam roll mat, but when inflated with air, are a lot more comfortable than the old roll mat. BTW, they inflate themselves to a certain degree. You often have to give them a blow to get them fully inflated. We’ve also been using SIMs for a few years now. The problem with many SIMs when it comes to family camping (or camping with a car), is that SIMs are designed to be small to easily fit inside a backpack. Being smaller means they are not as comfortable as an Air Bed (though surprisingly comfortable given their size). This year there’s been a redesign of the SIM for family camping. Outwell have created the Deepsleep, Dreamboat, and Dreamcatcher SIMs. A big difference with these SIMs is that they’ve not compromised comfort for size – after all, you’ll be travelling to the campsite in a car. 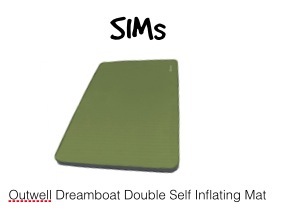 Some of these SIMs are more like memory foam mattresses with additional air inflation to make them bigger. I’ve had a test of these new SIMs and was very impressed. We’re now using an Outwell Dreamcatcher SIM. 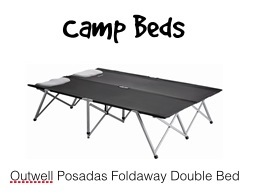 Camp Beds are simply foldable beds. If you find it hard getting up off an air bed or SIM on the floor, you will want to consider getting a camp bed. You can get both single and double camp beds. We’ve not yet been using camp beds, though we are thinking about it. Personally I find many of them a bit too rigid. However, that’s easily solved by getting one of the family camping SIMs (mentioned above) to use as a mattress on top of the camp bed. You will need more transport space to take a camp bed than an air bed or SIM. 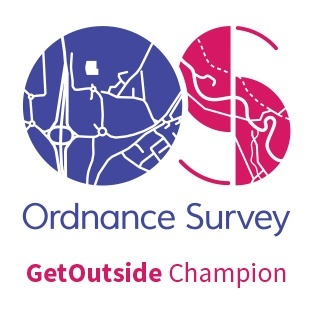 Another thing you’ll need to check is the dimensions of your tent bedroom. Not just the width and length, but also the height of the sloping area at the back of the bedroom. Many tents are designed expecting people to be sleeping on air beds or SIMs. As soon as you raise up higher, you may find that sloping area now hits your camp bed. 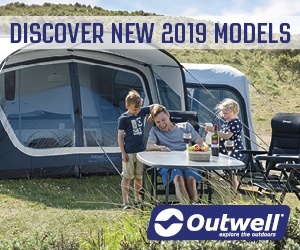 This is not the case with all tents though (and our Outwell Hornet XL tent appears to be raised slightly at the back enough for a camp bed (something I’ve got to check). 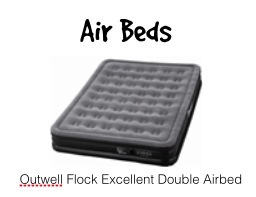 So if you bought a set of air beds, sims, and sleeping bags, you could be missing one vital ingredient…. Air Beds and SIMs lay on the ground. The ground is cold (especially in Spring). Your Air Bed (or SIM) will loose a lot of heat through the ground, making the air cold inside the bed, which in turn, makes you cold. One of the biggest reason for getting cold in the night is the lack of ‘ground insulation’. So unlike at home, where you may throw a blanket on top to avoid getting cold, you need to put the blanket underneath. Counter-intuative, eh? I have also put some foam packing material underneath our youngest’s bed, in addition to a large fleecy blanket. This simple measure has a big effect on keeping warm. If you can, put another layer on top of the air bed too. And whilst your thinking about making your tent warmer, you may want to get a tent carpet. It’s just a shame that most tent carpets don’t cover the bedroom area as well. Once the insulation underneath is done, then consider insulating on top. If it’s going to be a cold night, you want to make the beds as well insulated as possible. On a couple of recent camps it went down to a mild frost at night. We even put our coats over the sleeping bags, which helped a lot. Important: don’t wear too many layers in your sleeping bag, instead put layers over your sleeping bag that can easily be removed. If you wear too many layers you’ll sweat, but the moisture from sweating will actually make you very cold. The Best Set-up for Sleeping in a Tent? Some argue that the best setup in a tent is therefore a camp bed, with an air mattress on top, and a blanket on top of that. With an air bed you are kept away from the cold ground, and therefore don’t get as cold. As mentioned above, this is not something we’ve tried (yet). If a camp bed is something you could take and use, then this may be the best setup for your family. You can lay in your bedroom with your head opposite the door, or with your head by the door. It doesn’t matter. On a few tents the back of the sleeping pod (bedroom) slopes and sags a bit, so sleeping with your head at that end may mean you get some inner tent in your face. However, there is one very important factor in which way you lay: you want your head slightly upward rather than downwards, where your blood will rush to your head. Sounds obvious, doesn’t it? But it can easily be overlooked when you’re pitching your tent.  Even the flattest of campsites will have a slight slope to them….and we’ve found that some of the best family campsites do not have bowling green flat pitches. So, after pitching, before you setup the beds, just take a moment to lay in the bedrooms and find which way is up. That’s where your head should go. BTW, you may find that sometimes, ‘up’ may be different from bedroom to bedroom if your pitch has a number of different slopes. Sleeping bags are rated in seasons. We camp from Spring (usually Easter time) through to early Autumn. (September camping is great BTW). 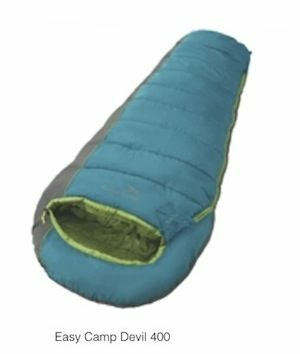 For us, 3 Season sleeping bags are the best, though Shell has been using a 4 Season sleeping bag (ladies, you will get colder than men, and you may want a warmer sleeping bag). A 3 Season sleeping bag may be too warm in summer, but on warm nights we leave the zip of the bag undone, and even sleep on top of it. (If you want to understand what the upper limit and comfort ratings mean on sleeping bags, read our four season sleeping bag article). The mummy shaped sleeping bags are the ones with hoods. They also tend to get smaller towards the feet. 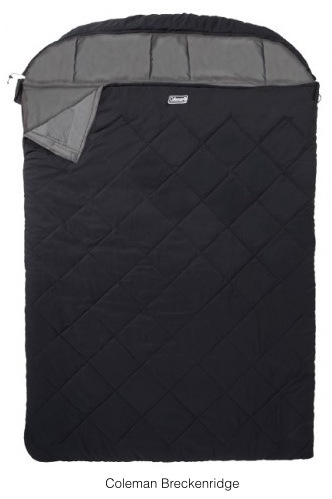 You may want to consider such a sleeping bag if you are camping in the cooler months as they are more ‘efficient’. Sleeping bags don’t warm you up. They work by keeping your body heat inside, and it’s your own body that keeps you warm. The mummy shaped sleeping bags are designed to minimise the loss of body heat. You can seal the hood so that only your face is exposed. The downside is that you may feel a little too constricted in these types of sleeping bags. Square shaped sleeping bags provide you with a lot more leg movement than mummy shaped sleeping bags. The problem is that many square shaped sleeping bags are only 1 Season, so be careful if you’re shopping for a square sleeping bag. There are exceptions though. This year we’ve been using the Coleman Breckenridge double sleeping bag, which is actually a 3 Season sleeping bag. It’s also the first double sleeping bag we’ve ever tried. We’ve been so used to mummy sleeping bags, that we thought that we’d end up kicking each other, but actually it’s been OK, even if a little less space than a full sized bed at home. We’ve not found a satisfactory camping pillow in all our years camping. The best solution is to take pillows from home. Unfortunately this can take up a lot of space in the car. The backpacker’s approach is to fill your sleeping bag’s stuff sack with clothes and use that as a pillow. We do have some inflatable pillows. These are horrible, but we found that placing them underneath the head area of the Coleman Breckenridge sleeping bag, they actually worked a lot more like real pillows. (Still not as good as proper pillows). The problem we’ve found, is that small children (babies, toddlers, pre-school), tend to move around too much when they sleep. So if you’ve made a nice insulated Air Bed, guaranteed they’ll end up off the air bed and on the cold floor at some point. The solution to this problem is to get one of these junior air beds with raised sides. 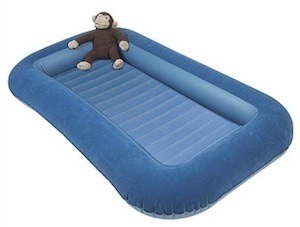 We’ve been using one of these air beds for years and it works really well. They’re slightly wider than an adult single airbed, but slightly shorter too. You can get child-sized sleeping bags. Both big brands like Outwell and Vango make them, along with a few other brands. 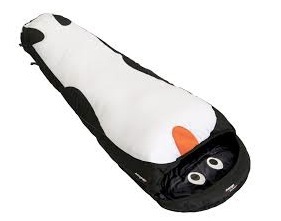 Our kids particularly like the look of the Vango Penguin sleeping bag (they love penguins), and getting such a sleeping bag may increase the fun level for your child. However, we’ve not been using any child sleeping bags…. If you have some spare adult sleeping bags, you could simply tie a knot in the bottom of the sleeping bag (so that your child doesn’t sink down inside the bag), and use that instead. Our youngest is currently in the Vango Wilderness 250 (yep, only 2 season), with another Vango Wilderness 250 unzipped and over top as an additional blanket when it’s cold. This is the first season that we’ve not had to tie the knot in the sleeping bag….he’s growing so fast! 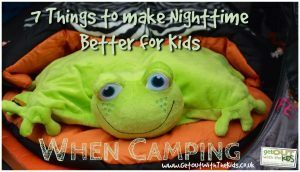 Click here for some more tips on making night time better for kids when camping. 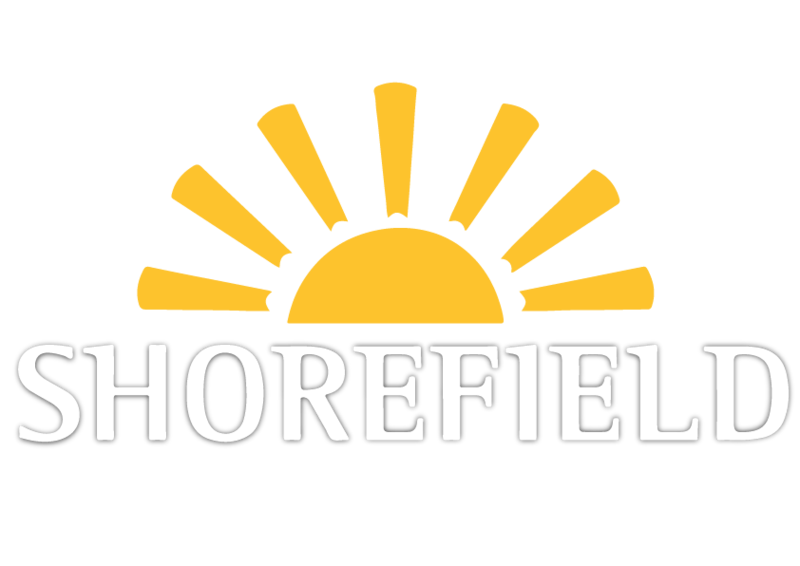 This post is part of a series that teaches you what you need to know to start family camping. Sorry to be a pinickity but you lie down not lay down. I.e. you lay the sleeping bag down on the floor the lie down inside it. The best things I ever bought for camping were two TF Gear Super King 4 leg fishing beds. Very large but I have a trailer. £170 each, but I can’t put a price on a good nights sleep. An engineer friend extended the legs for me, an extra six inches, perfection. All our sleeping bags, pillows, mattress toppers aand cool weather gear, go in vacuum suction bags,a small air pump with reverse is all you need for packing up. Love the website, even though I don’t camp with kids. Hiya fellow campers! I have tried all types of bed combos over the years, I usually camp for 1-2 weeks at a time and I love my sleep. The best I have found is a fishing camp bed. For some reason they are not targeted at campers, but the one I have is padded, has telescopic legs to counteract slopes and large feet that won’t damage the tent floor. My sister and I both get cold easily and have found these beds very comfy and warm. We also use the bed sandwich combo, pack a double duvet in a vac-pack bag (you can also put your pillow in and it squishes down to nothing), then you have an under layer of duvet, the sleeping bag, then a top layer of duvet. Snug as bugs! For extra luxury in autumn we have EHU and put a low wattage electric blanket under the first duvet layer. Yum Yum love camping! We, the Harpers, think your website is fantastic. What a great guide! After trying all forms of beds, we have recently purchased a thick memory foam mattress and covered it with an old sleeping bag to provide us with many more, ache free camping trips. We pack this first and it is compressed by the weight of the tent therefore taking up little space. (for absolute luxury buy the “XL” size – they still pack down pretty small. These pack down much smaller than pillows from home, are not as cold, and dry out much more quickly. The Exped air pillow is unlike other air pillows in that it has a flat centre so it retains the top pillow (other air pillows have a “belly” so that any top pillow just slides off and is useful because you can easily adjust the height you want your head… ideal if you get a cricked neck if the height isn’t “just right” (like my wife). The Thermarest compressible pillow is made from the foam offcuts inside the mats and so are very soft and compressible but still with a good level of support and provides warmth, comfort and acoustic insulation (if you have ever tried to sleep with your ear against an inflatable pillow you will know what I mean!). Expensive yes, but much more pack-able than pillows from home (a real consideration if you are taking two pillows per family member) and I personally think more comfortable than my home pillows… oh and my wife is happy which is the main thing. Thanks, Mark. I’ve got a couple of new Thermorest pillows that I’m hoping to try very soon. Vango has also made some new pillows that look good. I hope to try one of them too when they become available.